Happy Monday, everyone! It's an extra happy Monday around here...Todd is taking the day off to hang out with us! We have to head back to the old house (again) to pack a few more things, but then we have the rest of the day to just hang as a family. // Speaking of the old house, a big THANK YOU to everyone that came out Saturday! Wowza, I didn't expect that many people, but I'm certainly not complaining because we sold about 90% of all of our stuff, plus, I love meeting some of my local readers. I know some of you asked via Instagram if I would be selling anything on my blog or Instagram, and the answer is yes. Whatever I don't sell today (a few people asked if they could come look), then I will plan on selling on my Instagram account Caycee07blogsale. 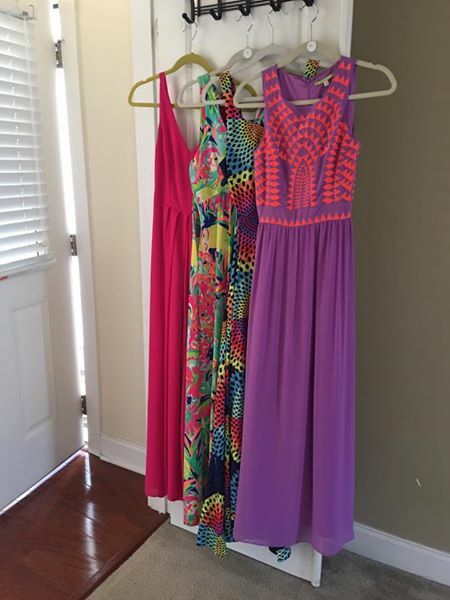 Unless they go today, these four dresses will most likely be for sale. // In other news, trust me when I tell you...this ruffle sweater is a must have :) It's super soft and the ruffle sleeves are the cutest thing ever! For sizing reference, it runs tts. // Sunday morning was spent lounging in my favorite pajamas. I'm embarrassed to say that I have them in three other colors as well. They are the best pj's I've ever worn, and as we all know, I've tried a lot...ha! I just couldn't resist these adorable stripes. And for sizing reference, these run HUGE, so make sure you size down. I'm wearing the xs, and I have a good bit of wiggle room. Hey girl! Love your blog :) Question- we are building a new house and considering a barn door going from our master bedroom into the master bath. Is it loud when you open/close? Girl do it, you will love it!! And no not at all, they install stoppers and you don't hear a thing opening or closing it! I soooo love your blog. I am so, so, so envious of your new home on THE Daniel Island. It really seems like the place to be! The community really seems lovely. Happy to see you and Amy Florenz are friends. She is a doll. You all have such similar tastes. I also LOVED your laundry room on IG. Major jealousy! WOW! You hit the jackpot with your custom build. Every day, I look forward to seeing more of your lowcountry home. Congrats on your successful moving sale. You deserve it! Caycee, never stop being YOU. I love how you open your home and family to your readers. You are so blessed and really have it ALL!!!! PS-don't judge...we are trying here in W'haw, but stereotypes are tough to change! Classic Annie lives here!!! Please please let me buy the purple with pink dress!!!!! Hi Caycee! Congrats on your new home- it looks beautiful. How is the sizing on the blush color sweater- I planned on ordering online since my local store did not have. I am 5'1, 112 lbs. XS or Small?